The Andrew Johnson NPS Visitor Center. Johnson's tailor shop is located just behind the large arched windows. 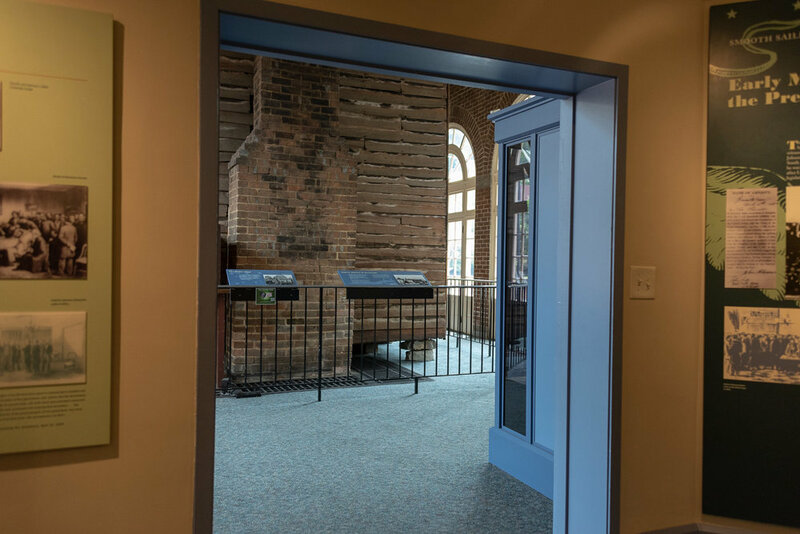 A view of the tailor shop from inside the Visitor Center. After entering the tiny town, the first stop on the Johnson tour is the NPS Visitor Center. 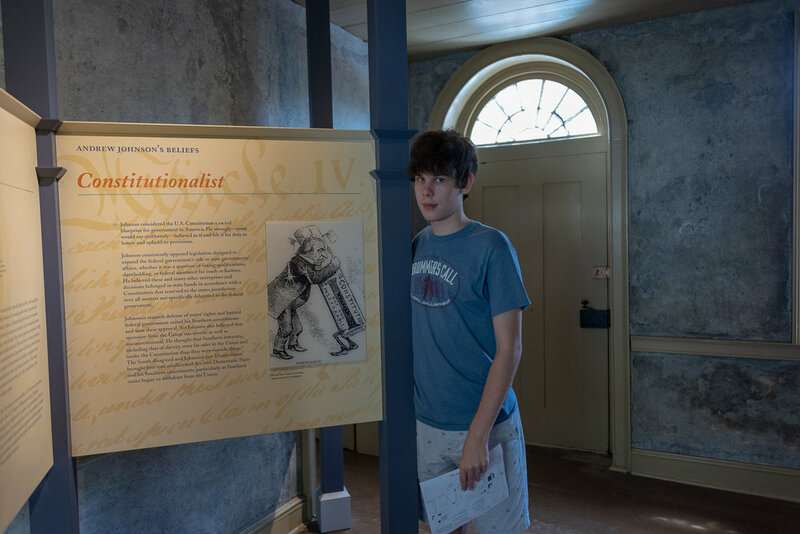 This building not only features a museum that encompasses Johnson’s entire life, but also includes a gift shop and Andrew Johnson’s original tailor shop. It’s literally inside of the Visitor Center! There’s also a short movie that explains Johnson’s rise to and fall from the presidency, after which you get to vote on whether Johnson should have been removed from office. Make sure you obtain the free tickets to the Homestead tour, which you will need later. I also suggest getting the Junior Ranger bag, which includes activities to do along the way. 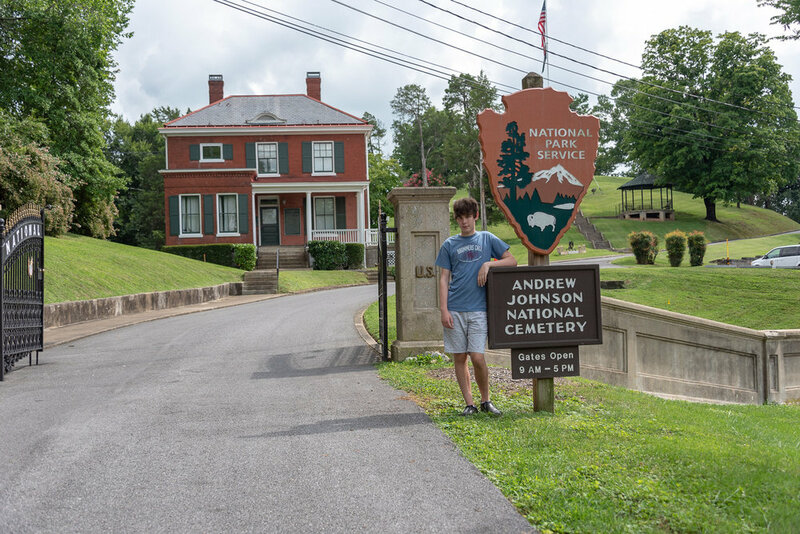 Once you have a general understanding of Andrew Johnson, you can begin traveling to the other buildings at the Andrew Johnson National Historic Site. The park is structured like a story, beginning with a model of Johnson’s birthplace and ending with his resting place. This allows visitors to achieve a complete picture of how such a humbly born boy trudged by sheer force of will to the highest office in the land. The start of this journey is in the Andrew Johnson Birthplace Replica. Though not the same log cabin that Johnson lived in as a child, the building does offer interesting insight into his earliest life stages. Andrew Johnson was born in a similar cabin on December 29, 1808 in Raleigh, North Carolina. With his father dying when Johnson was three, his mother apprenticed him to a tailor, where he would learn his iconic trade. Legal trouble eventually caused him to flee from the apprenticeship, and he would bring his family to Greeneville in 1826. With a grasp of Johnson’s childhood under your belt, the next place to head is Johnson’s Early Home. View of the NPS Visitor Center and Andrew Johnson's Early Home as seen from Johnson's Birthplace Replica. 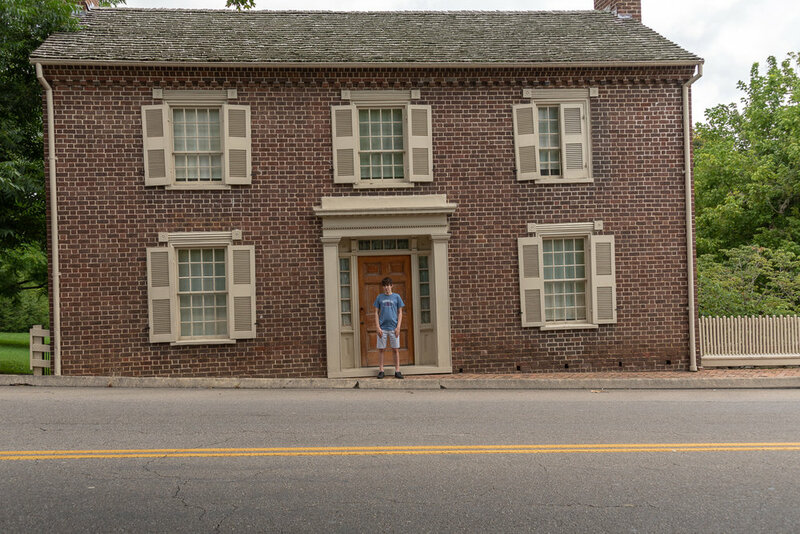 Andrew Johnson's Early Home is located right across the street from his tailor shop, which was the center of political dialogue in Greeneville. The Early Home, right across the street from both the Birthplace Replica and Visitor Center, is another Johnson gem. It’s structured as a mini-museum, focusing on Johnson’s entrance into politics and his core political and moral beliefs. However, it also includes a large timeline of Andrew Johnson’s life, and details his family members down to his great-granddaughter. The exhibit as a whole really helps you to understand Johnson both as a politician and a person. Johnson moved into the house in the 1830s, already an established businessman with a wife, Eliza, and two children. His reading and writing abilities were sharpened with help from Eliza, and his excellent tailoring and friendly attitude gained him popularity. It was at this point when Johnson would enter politics, first becoming town alderman, and soon after becoming Mayor of Greeneville and State Representative. Staying true to his roots, Johnson sought to protect the working class from an oppressive national government, and believed in a strict interpretation of the Constitution. He was against slavery, believing it only kept power in the hands of the slaveholding aristocracy, and voted several times in favor of emancipationist interests. Having established himself as a solid Democrat in favor of the working class, his popularity in Eastern Tennessee only increased, and Johnson became a member of the U.S. House of Representatives in 1843. He would serve five terms in the House, and in 1851 he would buy a new brick house on Main Street. 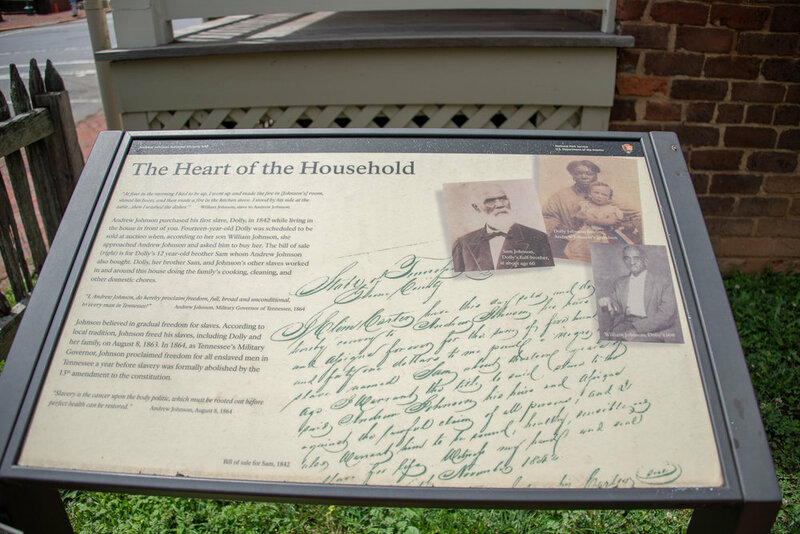 When you finish looking around in Johnson’s Early Home, you can walk a couple of blocks to the main attraction: The Andrew Johnson Homestead. 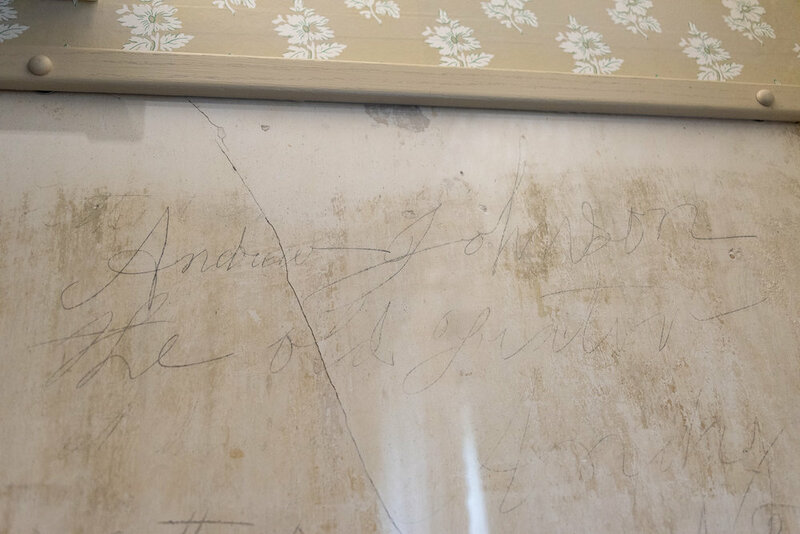 Below are pictures from the inside of Johnson's Early Home. Though the time on your ticket dictates when you go to the Homestead, there are several sites to see on your way there. These include the Greene County Courthouse, a large statue of Johnson, and several miscellaneous historical signs. Just make sure you’re on the Homestead porch five minutes before the tour begins. Andrew Johnson mural located on Main Street. Greene County Courthouse features several statues and monuments. 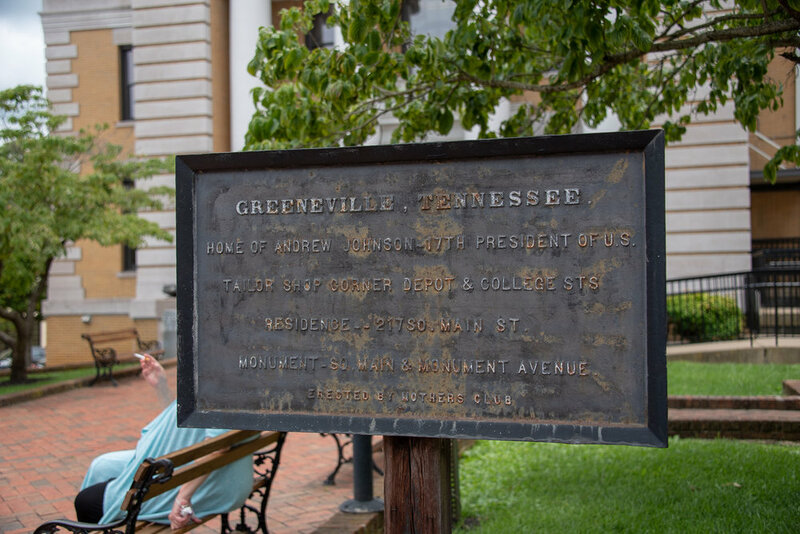 A vintage historical sign located in front of the Greene County Courthouse. Andrew Johnson Homestead - the view is facing Main Street. The tour guide that I got at the Homestead was extremely knowledgeable, having been doing tours for around ten years. She’ll be able to answer any question you might have. The home and its interior are 85% original to when Johnson and his family lived there, and there are a lot of pieces inside. The guide goes room by room, explaining who lived there and what their story was. There were some extremely interesting tales, though I will warn you, there is a lot of death by tuberculosis. After the tour is done, you’re free to roam around the estate, exploring its vast green acreage. Johnson actually lived in the house during two separate periods: firstly from when he bought it in 1851 to the start of the Civil War, and secondly from after his presidency to his death in 1875. He won two terms as Governor of Tennessee from 1853 to 1857, after which he was elected to the U.S. Senate. As tensions over slavery began causing states to secede, Johnson sided with the United States, believing the South had no right to leave the almighty Union. When the question of secession came to Tennessee, it voted in favor, and Johnson fled Greeneville as the only member of a seceded state to remain in the Senate. His continued unionism would have him placed as Military Governor of Tennessee by Abraham Lincoln in 1862, where Johnson sought to eliminate Confederate influence. He did well in this position, and a pleased Lincoln placed him on the Union Party ticket as vice-president. When the pair won the election in 1864 and the rebels surrendered a few months later, things seemed to be going well for Lincoln. However, an assassin’s bullet on April 14, 1865, would be his demise, and a stunned Johnson would take his place as head of the country. Radical Republicans in Congress thought Johnson would be easier to agree with than Lincoln had been, but clear differences in policy quickly emerged. Johnson’s desire to give local governments more control directly contradicted a Republican Congress wishing to micromanage every aspect of the defeated South. A series of Johnson vetoes and Republican veto overrides soon followed, as Republicans won enough Congressional seats in the 1866 midterms to completely shut out Johnson. The confrontation came to a head in 1868, when Johnson fired the Republican Secretary of War Edwin Stanton, which violated the recently created Tenure of Office Act. Though the Articles of Impeachment presented a weak argument, Radical Republicans were so eager to get rid of him that he was formally impeached by the House of Representatives soon after. The Senate had enough Republicans to remove Johnson, but seven of them sided with the Democrat, and he escaped removal by a single vote. Johnson, completely devoid of any political support, would finish his term and return to his home in Greeneville in 1869. After finishing your tour of the Homestead, the last stop on the Johnson tour is the Andrew Johnson Family Cemetery. Side View of the Andrew Johnson Homestead. Andrew Johnson owned this home for twenty-four years and lived here both before and after his presidency. It is situated on its original two acre lot. 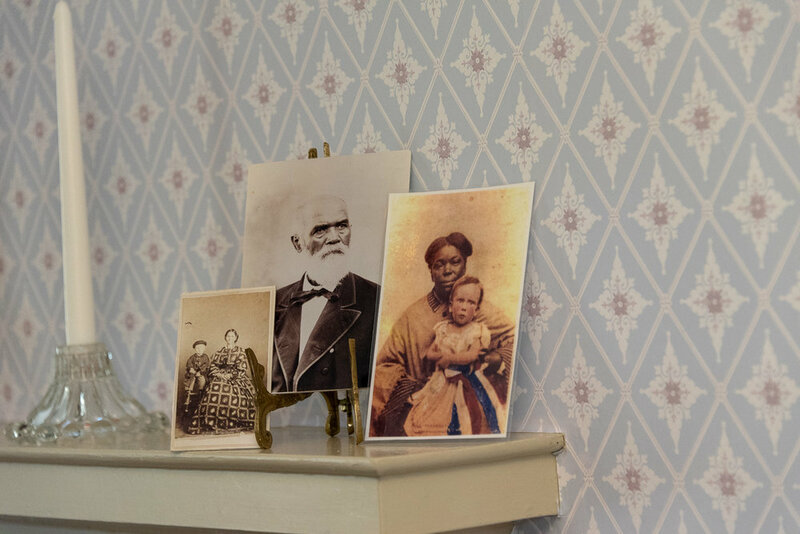 Below are some items from inside the Johnson Homestead. Click on each picture to learn a bit more. This pecan tree is the only remaining witness tree from when Andrew Johnson lived in the estate. 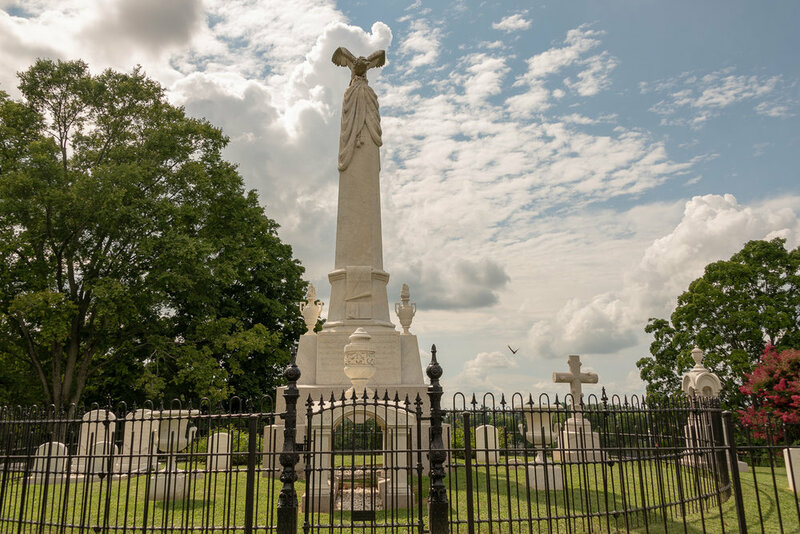 The cemetery sits on the top of Monument Hill, which gives visitors a great view of Johnson’s beloved town. The gated area actually features many Johnson descendants, including his great-granddaughter, Margaret Patterson Bartlett, his last direct descendant. However, the highlight of the cemetery is evidently Johnson’s burial spot, marked by a tall, ornate obelisk. After Johnson left the presidency, he was still determined to have a political impact, and became the only ex-president to be elected to the Senate in 1874. Tragically, he died only months after taking his seat in the Senate after suffering a stroke on July 31, 1875, 143 years ago today. He had requested that he be buried wrapped in an American flag with a copy of the Constitution under his head. The formidable monument marking Andrew Johnson's resting place. The impressive view one gets when gazing at the Blue Ridge Mountains. Andrew Johnson’s presidency was certainly rough at best. His attempts to usher in the Southern states and protect the rights of ex-Confederates were seen as traitorous by many Republicans. However, he had a firm and respectable set of beliefs that certainly should not be ignored. He believed that the working man should have a voice in government. He believed that the Constitution was the essential document of the country, and that it must be applied to everyone equally. But most of all, he considered the preservation of the Union of utmost importance, and risked his life on several occasions to keep it from dissolving. 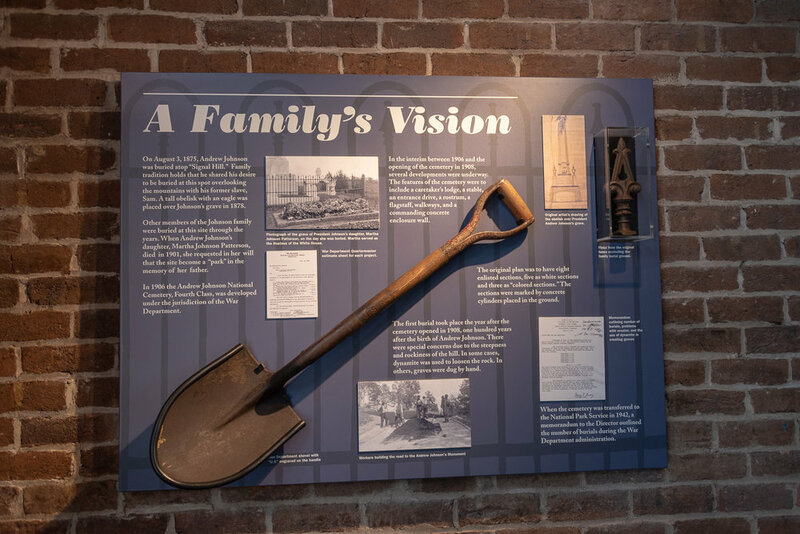 His decades of public service should not be thrown out solely due to an imperfect presidency, and his legacy will always be preserved at the Andrew Johnson National Historic Site in Greeneville. I encourage everyone reading to venture to the mountains of Eastern Tennessee to form your own opinion of a man who is often glossed over by history books. For no matter how hard you try to tell them different, the people of Greeneville will always revere their local hero.